Where can I find Middle Grade science fiction with diverse characters? I hear this question a lot lately. 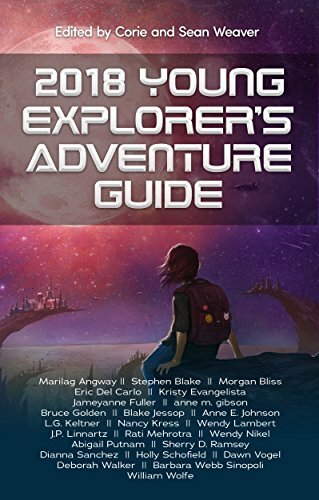 One answer is the 2018 Young Explorer’s Adventure Guide, now available from Dreaming Robot Press via various sources and formats. I’ve wanted to have a story in this anthology ever since I read the 2016 and 2017 issues. Attuned for ages 8 to 12 (Grade levels 2 through 6), it offers inclusive, imaginative science fiction of all kinds. And new Nancy Kress stories are always a treat, regardless of intended age level. My story concerns an adventurous little girl who sneaks out of her habitat home on planet Skag3, defying her mother’s orders. Will she learn that her actions have consequences? It’s one of twenty-four stories in this year’s wonderfully thick anthology. As the Kirkus starred review says, “…this stellar collection will appeal to both teens and grown-ups who dream of future worlds”. You’re in good company, well done!